We had a fantastic morning at The Lion Inn. We hosted our October Employment Law workshop – Redundancy and Dismissal. This month’s event has been our most popular! Our workshop’s are open to our clients that we work regularly with. We also welcome those we would like the opportunity to work with in the future. It was great to see both new and old faces round the table today! Lorraine (Pursuit Managing Director) welcomed the clients at 9am at The Lion Inn with Sarah and Courtney (two of our Recruitment consultants). With a full English breakfast to start off the morning, our speaker Cas Carrington from KLC Employment Law Consultants LLP, kicked off today’s workshop with an exciting introduction to the topic – Redundancy and Dismissal. Full of informative, real-life case studies, Cas delivers a compelling session. 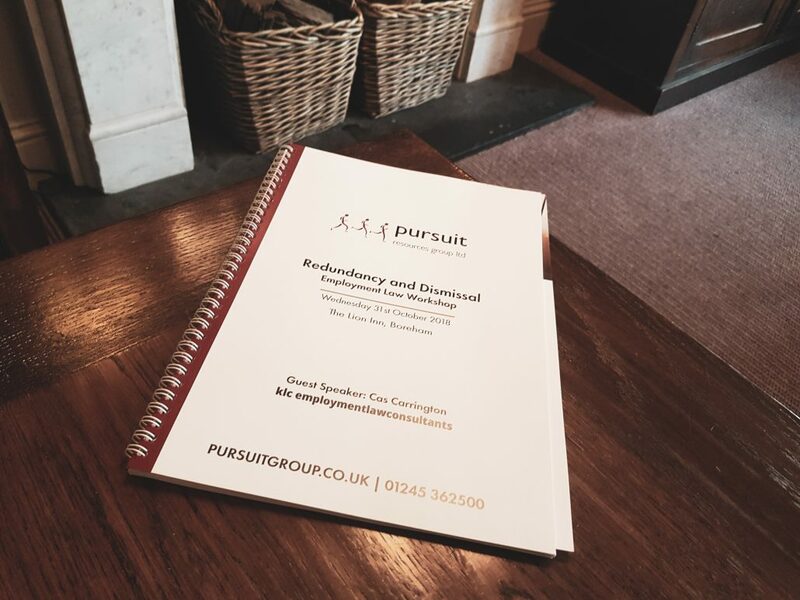 It gave our clients a refresher on the law around Redundancy and Dismissal. Since introducing our workshops we have been overwhelmed with the positive feedback from our clients. As they are more intimate, our clients are encouraged to ask questions and discuss any issues that Cas covers. Due to Cas’ background, the workshops and seminars count towards your CIPD training or CPD hours. Cas is the lead tutor for the CIPD Law on Tour workshops and also tutors on CIPD law courses, including the Advance Level Award in Employment Law and the Postgraduate Certificate in Employment Law. Cas also delivers training for the CIPD In-Company Solutions. Our next event will be held on Tuesday 27th November 2018. The topic of discussion is Sexual Harassment and Religion. Full details of the event are on our website. Due to the popularity of this months we recommend sending us your interest for a place as soon as possible. Whilst we cannot guarantee a space, we try to accommodate as many clients as possible – and as fairly as possible to ensure our clients can attend at least one of our events this year. If we are unable to guarantee a space on our next workshop, we do have our main Seminar on 21st March 2019 so be sure to put the date in your diary! Do you want to read more about our past events and Employment Law Blogs?